I'm researching my great uncle, George Henry Hartland (R6618), of 9 Btn KRRC. I have a copy of the war diary but I am having trouble pinpointing exactly where the battalion fought during the last week of July 1915, when they helped to retake ground lost during the "flamethrower" attacks at Hooge. We will be going to Ypres in October to see where he fought and would like to be able to see the exact places where he was in action. He was wounded in action on 31st July and died on 4th August at the Military Hospital in Etaples. Any assistance you can give would be very welcome, including pointing me towards other sources of information. Interests:WWI and WWII. Qualified Battlefield Guide conducting tours to the Western Front. I'll dig out a trench map as well. I9 is to the east of Ypres and is roughly where they started from, see the map below. This puts them on the Menin Road just to the west of White Chateau. 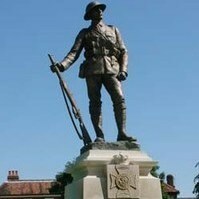 Today that would just be within the suburbs of Ypres past the roundabout that used to be Hellfire Corner. Next map, this one of the Hooge area. I'm wondering if your G is a C? As I can't find a reference to a G but can to a C. This would then correspond to Grid 12 above the Hooge area which is now part of the fun park there. Next one, this map is dated August 1915, showing you Grid 12. 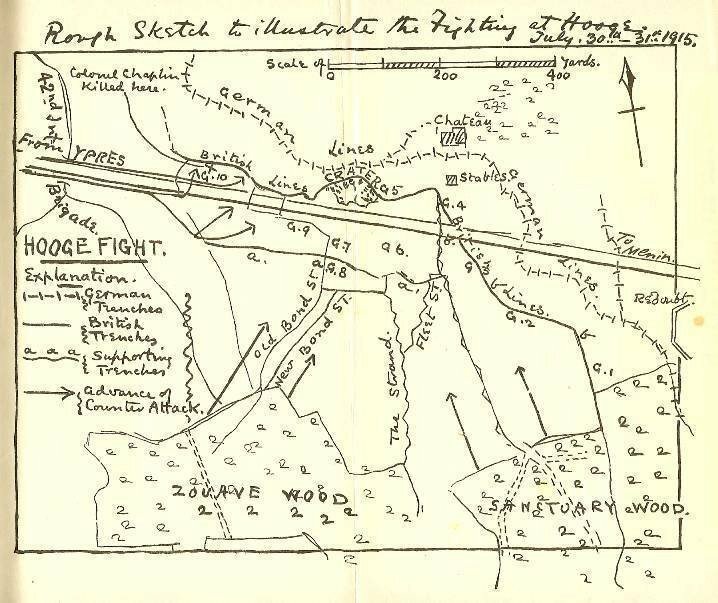 The attached map is from the Divisonal war diary. On the 30th orders were received to carry out an attack on trench 9-10. The attack was near the Culvert under the Menin Road. We were to assist in trying to retake the trenches which had been lost during the liquid fire attack on the 8th Rifle Brigade at 3.20am that morning. At noon the battalion, led by Colonel Chaplin, assembled close to and south of the Menin Road in rear of the rest of the brigade holding the front line trenches. A covering artillery barrage lifted at 2.45pm and the attack was launched, preceeded by the bombers under Lieut. H.S. Richmond. "B" Company (Capt. Tanqueray) and "D" Company (Capt. Durnford) in two lines cleared our front line and rushed the 200 yards to the enemy trenches whaich they carried at the bayonet point. The trench G-10 was taken but a lively bombing encounter took place and considerable losses from rifle and machine gun fire occured. Three platoons of "C" Company (Desmond Young) were almost wiped out when charging in the direction of Old Bond Street in order to cover the exposed flanks of the two leading companies. In a spirit of bold initiative the Company was again led forward by its Captain. The main attack which was by the 41st Brigade had, however failed and an overwhelming fire made further progress by "C" Company impossible. The arrival of "A" Company under Captain Exell from support enabled consolidation to take place. Captain Exell showed great gallantry in going forward under heavy fire to bring in Captain Young who was badly wounded. Taken from 'Celen Et Audax' being a record of the 9th K.R.R.C. 1914/1918 by the battalion Inteliigence Officer. As Steve mentioned, we've had a few requests about this Action lately, so that's spurred me into getting round to transcribing the detailed report by General Hutton entitled Trial By Fire in the 1915 KRRC Chronicle. It's probably easier to read than the War Diary and will no doubt be based on it. Apologies in advance for any of my typing errors! 9/KRRC were involved in the counter-attack on 30th July approaching along the Menin Road in co-operation with the 41st Brigade attack from Zouave and Sanctuary Woods. Trench G10 can be clearly seen about 400 yds west of Hooge Chateau and includes the spot marked with an 'X' where Colonel Chaplin, the battalion commander was killed. A detailed comparison with Steve's trench maps should allow you to pinpoint this spot. 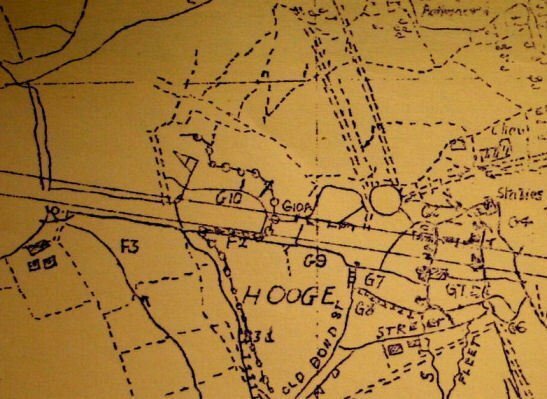 The crater shown to the north of the "g" in "Hooge" on the trench map in Post #4 may well be the crater on Hutton's sketch map. It is now time to describe the method of attack adopted by the 9th Battalion of The King's Royal Rifle Corps, which, under Colonel Chaplin, had been directed to co-operate by the Menin Road with the counter-attack carried out by the 41st Brigade just narrated. This Battalion, belonging to the 42nd Brigade, had been in reserve near Ypres, and receiving instructions through its own Brigadier moved out soon after noon, ready to co-operate along the Menin Road. Arriving at the point of assembly before the bombardment had begun, detailed orders were given by Chaplin that two Companies, B and D, should advance at 2.45 p.m. on either side of the Menin Road towards Hooge; B Company on the right was ordered to seize a trench to the south, and D to seize a trench to the north of the main road, both of which had, it was believed, been occupied by the enemy after their successful assault with liquid fire upon the 41st Brigade in the early hours before dawn. The remaining two Companies, C and A, were to follow in support. The Battalion was near to but not actually in touch with the 41st Brigade, and though in co-operation with his troops, did not act under the orders of its Brigadier. The 9th Battalion being recently held in reserve was well rested, comfortably fed, and was in splendid fighting condition. Inspired by a deep devotion to their Colonel, in whom they had implicit confidence, it was eager for distinction. Precisely at the hour named, 2.45 p.m., the advance began. The bombers of the leading Companies forming the first line were extended on a front of sixty yards, and passed through the front trench firing line of their comrades of the 9th Battalion Rifle Brigade, holding the advanced trenches of the 42nd Brigade some two hundred yards from the objective which had been indicated to them. The two Companies followed each in three successive lines. During the preliminary bombardment, and up to this point, there had been good cover, as the advance had been by fairly good communication trenches; the losses had been consequently small. Chaplin-the better to direct his men proceeded with the third line of the leading Company, B. After clearing the front line trenches held by the 9th Battalion Rifle Brigade, the bombers and the foremost lines of this Company, acting upon Chaplin's order, rushed the main trench, G 10 (vide sketch), sweeping away the enemy who held it-and established themselves at the eastern end. The next Company, D, changing their original objective followed in support of B, and made good the western end of the enemy's trench. The main task had thus been achieved! In this gallant assault the leading men were enfiladed by fire from Hooge vil1age, when a gallant young officer (2nd Lieut. 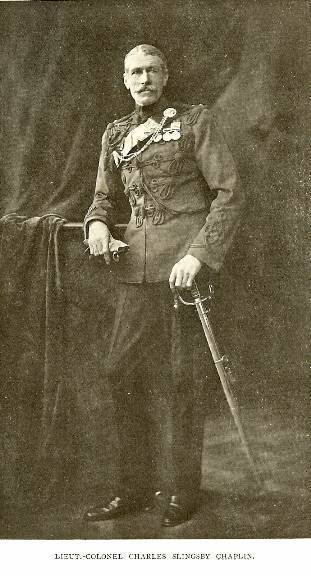 W. P. Geen) and a few men, fired by a sudden zeal, made a desperate charge, and, closing with the enemy, were never seen again. The Colonel, in the act of directing his men to make good their success, came suddenly under machine-gun fire and fell, killed instantaneously by a shot through the head. Durnford, commanding D, and Tanqueray were also killed about this same time and place, and other officers and many men fell, whereupon Benson, the senior officer, took command, and made the necessary dispositions. D Company having been directed to support B Company by Chaplin's latest orders, the two supporting Companies, C and A, were directed to seize the trench south of the Menin Road which, it was found, had not been occupied by the enemy. In the course of this being carried out the officer commanding the leading Company, C, thinking that he saw an opportunity of relieving the exposed flank of the two leading Companies, and with a bold initiative called upon his Company to charge. "Nobly did the officers and men respond," states a responsible senior officer, "but few got beyond a point fifty yards from the trench, where many officers and men were shot down by machine-gun and rifle fire from Hooge and from the neighbouring enemy trenches." This gallant effort would have led to important if not decisive results, not only by supporting the successful attack of B and D Companies upon trench G 10, but also by relieving the pressure upon the left flank of the 41st Brigade (Rifles), where the 8th Battalion Rifle Brigade were losing heavily. Major John Hope, the second in command, was at this time struck on the head by a bullet and temporarily disabled, while many officers and men were killed or wounded. The main attack of the 41st Brigade however – attempted, as has been shown [earlier in the article and not transcribed here], over 200 to 300 yards of open ground – had not been successful. The greatest gallantry was shewn by A Company, the last to come up, a portion of which arriving in the trench in support of C made good its capture, and in spite of a murderous fire strove by bold individual efforts to carry in their wounded comrades lying in the open. "Captain Exell, of A Company, himself went out in the most gallant manner," writes a brother officer, " and brought in Captain Young, of C Company, who was badly wounded. Going out again to assist a private Rifleman, Exell was himself dangerously wounded, and died the following day." At this moment Captain Christie with ,the remainder of A Company arrived, and, taking command, consolidated the defence of this trench and connected up with the left of the 41st Brigade, by this time holding the edge of Zouave Wood. Thus Oliver Nugent, commanding the 41st Brigade, in writing of the gallant efforts and steadfast courage of his own Riflemen during the unsuccessful counterattack, was able to add in truly chivalrous and characteristic terms that his old friend and comrade "Chaplin was killed, most gallantly leading his Battalion .... His men did even better than mine, because they came up on the flank, and did recover some of the trenches on our left, which we had to evacuate when they were outflanked by the centre going in consequence of the liquid-fire attack and overwhelming onslaught of the enemy." During the evening two additional Infantry Battalions were sent up as reinforcements, and after dark the slender but still unshaken remnants of the 41st Brigade of Rifles were withdrawn into reserve. The fresh Battalions were ordered to dig themselves in along the edge of the woods, sending out officers' patrols to give warning of the enemy's further movements. One Company was also moved up into an unfinished communication trench, which did valuable service by flanking the German attack attempted soon after. At 2.20 in the morning of the 31st the enemy renewed their attack on Zouave Wood, preceded by liquid fire, the flames of which through the trees and branches seemed more like incandescent smoke than jets of fire. "This attack," writes an eye-witness, "was very soon stopped, and then followed the most terrific rifle fire all along their front, and a very heavy shelling of the wood." The outburst of firing brought back the weary remnants of the 41st Brigade, who had barely reached their bivouac. "The night-battle waged," continues the above .... "We lay under cover, and waited and watched; ready to stick it and stand a charge; or to charge ourselves This heavy fire was kept up without ceasing until daylight, and a vast number of flares were kept continuously burning. At dawn the firing died down, and all was well." All through the 31st the Brigade, reinforced by the additional two Battalions, gallantly held on to the edges of the woods, continuously losing officers and men until late in the afternoon, when it was withdrawn. So ended the Trial by Fire of the three Service Battalions of the Regiment, the first to be called upon to show their worth. For six weeks the ordeal had lasted, during the last ten days of which no trial could well have been more severe. "In the fighting of the 30th the Brigade lost 53 officers and 1,400 men, and during the whole period over 2,000 men.... " The 9th Battalion on the 30th lost 17 officers and 333 other ranks. I've looked through the 9th Battalion War Records section in the KRRC Chronicle (actually included in the 1916 edition, not 1915) for detail on where the battalion was in the days before July 30th 1915, but I'm afraid it is unspecific merely saying "during the month of July the Battalion held various sectors of the line in the salient"
'At the same time as 41st Brigade were making their counter-attack from Zouave Wood, 9/KRRC of our brigade was ordered to counter-attack through our portion of the front line. Old Colonel Chaplin, a most gallant old soldier, came into my dug-out and asked me to help him to have a good look at the German line from wherever I thought best in my sector; and to tell him which trenches he might use to move up his men. I took him to "A" Company position and showed him everything and then I went back to arrange for the passing forward of 9/KRRC and I asked them to concentrate as much as possible so that they could be well up when needed. I then went back to my own HQ and my own work All this moving around sounds very easy but one carried one's life in one's hands the whole time in the frenzy of shelling that was going on, together with the rifle and MG bullets which were flitting about everywhere - in fact it was as beastly as it could be. "... I had implored Chaplin to have a good look before he attacked and not to just rush out as he did. My officers told me that as soon as he had heard that his battalion had arrived - though he must have known it was strung out down the narrow communication trenches, he jumped over the parapet near the bomb store, calling out "come on Rifles" and had only gone a few yards before he was instantly killed. He was a very brave old man and a good type of the Old Army now gone - as was our Brigadier." Lt.Col Chaplin had been the commander of 3rd KRRC until his retirement in 1912. He came out of retirement to form and lead the 9th (Service) Battalion. He served with 1/KRRC in the Chitral Expedition of 1895 and commanded a battalion of Mounted Infantry in South Africa. Definitely an Old Army type! I also notice he had retired to Erbistock Hall, near Ruabon, which is close to me here in Chester. Something that should be mentioned regarding this counter attack is that two of the Brigadier's on the spot were totally against it with the Germans being allowed too much time to consolidate and arm to the teeth, which they most certainly did. Villiers-Stuart of the 9th RB comments "The Criminal error of Division was in making this counter-attack too late. If it had been launched at the moment when the Germans had taken the 8th Rifle Brigade trenches and before they settled in, it might have succeeded. As it was it was hopeless from the start and a useless waste of life." Lord Kitchener brought up this counter-attack at dinner with Lord and Lady Desborough, who had lost their son Billy Grenville with the 8th Rifle Brigade in the counter-attack, a few weeks later saying that this was a classic example of how not too launch a counter-attack. One of the Brigadier-Generals that objected stated that he would need a Division to take back the position with preparation time which turned out to be accurate as a whole Division attacked the area the following month. What was Brigadier Nugent's position? The only shortcoming I find with the wartime KRRC Chronicles is that they were written after the war. The RB Chronicles also do not carry quite as much critical analysis, the bits placed here came from Villiers-Stuart's book "Villiers-Stuart Goes to War" and the bit about Kitchener came from Lady Desborough's book "Pages from a Family Journal" which is a great read about the family in whole and their life, but very good concerning the two Grenville brothers, one of who acted as Kitcheners page boy with some marvelous pictures of the two boys. "and now we were in for a real attack, and one in which I for one, and some of my colleagues, honestly felt that there was not a fraction of a chance of success; 800 to 900 yards across the open, up a glacis held by trenches, with no covering guns, and under an unholy bombardment from every type of German gun, fired from every side into our salient. Barely time to say a word to their Companies, our four good Company officers got to their stations. It certainly seemed a case of goodbye to this world, but I only felt a kind of regret that it was not a show more likely to succeed." Oliver Nugent was one of the Brigadier-Generals that protested about the counter attack, and protested again when the counter attack was hung up, but the order came from Division to attack again. Thanks to everyone who has contributed in the past 24 hours or so. Your response has been fantastic. I'll go through everything you've provided with great interest. Hi Just been reading your post with interest and wondered how you had got on with your visit this month? I have been researching my Great GrandFather A3053 Lce Cpl William Carrington, 9th Bn KRRC D Company. As you can see he was in the same company as your Great Uncle and would therefore seen the same action, he survived the re taking of the trenches, but was then wounded in Feb 1916 in the hand, he returned to his unit in april 1916 but was sadly killed at the beginning of June that year. I have been quite lucky and now have copies of his "burnt records" as well as all the info you have below, but I would be interested in hearing of your experiences when you went over there to visit. Also have you been to the KRRC Musuem in Winchester? I am thinking of paying them a visit in the next week or so. Thanks for your interest. We went to the Menin Road and managed to work out roughly where the action he was involved with took place. There is a hotel near the Hooge Crater Museum with what remains of the crater in the grounds with some trenches from, I believe, 1916 which is probably the most evocative point. The memorial to the KRRC looks somewhat out of place with the amusement park in the background. The maps that the correspondents of this forum so kindly posted were very useful, particularly the sketch map from General Hutton's report - thanks Mark. In terms of the local museums, the Hooge Crater Museum was wonderfully arranged. The Sanctuary Wood Museum is a complete disaster - no attempt to arrange the artifacts or to catalogue them; a complete joke, considering the importance of the site. Haven't been to the KRRC Museum yet. Unfortunately its not open on Sundays which is the best day for me to visit. I know this is an old thread and there are a number of others covering the events of 30/7/15 but this thread is specific to the 9th Bn so I thought I'd just add a bit of info here. Forgive me if it is of no use. But I was researching Pte Frederick Gower, A 2526, who was wounded at this time. My conclusion is that those in the Times list of 30/8/15 were casualties of 30/7/15. There always was a delay of a month in publishing casualty stats. Up till 1915 the Bn was also given and even a reporting date (in this case 13/8/15) so it all ties in. On that basis if it is of interest I could add to this post the list of names in the wounded and missing category because I have them on a spreadsheet? PS if anyone has any non-military info on Gower I would be grateful. Discharged 16/8/16 wounds his SWB gives me no clue to his age and the CasList doesn't state hometown. So I've no idea who he was. I trust those of you who've driven this thread in recent years will understand why I'm using it as my launch point for some fresh research about my wife's great uncle, John 'Jack' Townsend. He was in 7Bn Kings Royal Rifle Corps and was mortally wounded on Thursday, July 29, 1915. He died in hospital in Boulogne on Thursday, September 2, 1915, aged 20. He had join up in April, 1915, and had only been at the front for days when he was wounded. A letter written by his sister while he was in hospital suggests he hadn't even seen a German. We've driven along the Menin Road from Gheluvelt (my main interest as a Worcestershire lad) many times, and also visited the Hooge Museum and Sanctuary Wood, knowing that 7Bn were located nearby when Jack was wounded, the day before the infamous events of July 30. However, that's where our knowledge of his very brief war rests, at present. I'm encouraged by mention above of the KRRC Chronicles, Are they publicly available? If so, as those pulled towards the Worcestershires can via Stacke's biblical The Worcestershire Regiment in the Great War, do the Chronicles cover individual battalions down to Company and Platoon level, for the activities of individual days? I think that's all for the moment. Thanks, in anticipation, for any help you can give in suggesting which paths to follow from here. A quick follow-up, with apologies, as I missed the setting for receiving notifications for replies. Ball-watching, as my Dad would have remarked. My own KRRC grandfather was in the Kidderminster/Bewdley area, so another Worcestershire lad. R/11456 Rfn John TOWNSEND is listed as 7/KRRC. Embarked 21 Jul 1915 and Died of Wounds 02 Sep 1915. All as per your info above. 7/KRRC went out earlier than this, on 19 May 1915 as part of the 14th (Light) Division. John's embarkation date of 21 July 1915 is the same as the KRRC battalions of 59 Brigade in 20th (Light) Division. Clearly it is highly likely he travelled with them, but as he is only listed under 7/KRRC, he must have been posted to 7/KRRC before he left Blighty and landed already allocated to them as a replenishment draft, rather than being transferred from 10th or 11th KRRC on arrival at the Infantry Base Depot in France. The 7/KRRC war diary list a Replenishment Drafts of 2 officers and 51 ORs arriving on 21 Jul7 when the battalion was in billets 2 miles west of POPERINGHE. On 23 July 1915, they moved to bivouacs 400yds west of VLAMERTINGHE and another Replenishment Draft arrived, this time of 2 officers and 90 Rs. VLAMERTINGHE is a couple of miles west of YPRES. It would be unusual to arrive in theatre and then join your battalion on the same day, so John is likely to have been in the 23 July draft. This short period of rest behind the lines came to an end on 29 July. At 19:00hrs, the battalion paraded and then moved up the line to relieve 8/KRRC in the trenches just to the right of the HOOGE CRATER and immediately south of HOOGE CHATEAU. The relief was completed at 01:30hrs on 30 July. The German Liquid Fire attack began at 03:00hrs. The 7/KRRC war diary has no mention of any casualties on 29 Jul while they were still in billets before the 19:00hrs parade. Moving up the line was inherently hazardous with night time enemy artillery being 'business as usual'. The actual relief was suspiciously quiet - this is remarked upon IIRC, as no matter how carefully the units switched places, it was almost impossible for any relief to go undetected by the Germans and this normally would have brought down opportunistic shellfire. Obviously the Germans opposite were busy with plans of their own . In the absence of further evidence, I'd say John is likely to have been wounded between 19:00hrs and midnight somewhere between YPRES and the immediate front-line sector and almost certainly by an artillery gunshot wound. Do you have any medical info for him while he was being treated? A dressing station or CCS reference might give us clues as to how far he had got. I have not looked for a Service Record as you seem to have the core research already very well covered. Further to the above, John Townsend does indeed have a Service Record extant. 16 Apr 1915 - posted to 5/KRRC, one of the Reserve battalions tasked (inter alia) with training replenishments. 5/KRRC was at SHEERNESS with Bn HQ at FORT GRAIN. 02 Jul 1915 - minor disciplinary offence for absent 3 or so days while with 5/KRRC at SHEERNESS. Probably some mitigating circumstances as he was only fined. 02 Aug 1915 - admitted 44 Field Ambulance. This was one of the three FAs attached to 14th (Light) Division. I'm uncertain, but I think they were at POPERINGHE at this point. 05 Aug 1915 - telegram sent by Proelicas (Battle Casualty Office) to regiment at WINCHESTER that J Townsend dangerously ill with GSW Legs and to inform relatives. 02 Sep 1915 - Died of Wounds at 24 General Hospital.